Led by Kari Shimmomura (2001-04) - the first four-time all-conference honoree in program history - Menlo players have captured 31 All-Cal Pac awards during Imwalle's tenure, including eight Player of the Year accolades. Six Menlo players have garnered Academic All-America honors while then-junior Deborah Bekowies became the first to earn Honorable Mention NAIA All-American status in 2008. A two-year starter at Long Beach State, Imwalle helped lead the 49ers to the 1970 NCAA title match. After earning a history degree from LBSU, Imwalle enjoyed a standout career on the beach volleyball circuit, winning four tournaments - including a Hawaiian Open title - and being named a "Legend of Beach Volleyball" for the 1970s. In 1992, Imwalle earned All-America accolades as his Masters age-grade team captured the USVBA title. Imwalle began his coaching career as an assistant at his alma mater in 1981, assisting the 49ers to the NCAA West Regional finals. 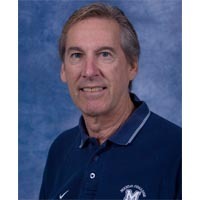 He later served as the head coach at Estancia High in Costa Mesa, Calif.
Imwalle is also the men's golf coach at Menlo while his wife, Kathy, is the administrative manager of athletics.